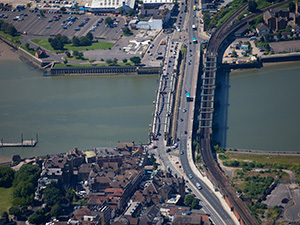 The Bridge Chapel at Rochester was built by Sir John de Cobham, who lived at nearby Cooling Castle. 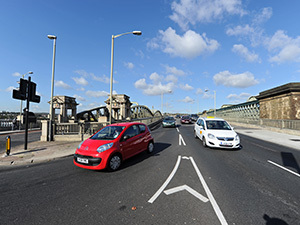 Described as “newly constructed” in January 1393, the chapel was located on the eastern approach to the medieval stone bridge, formerly called Chapel Lane or Bridge Lane, but today known as the Esplanade. 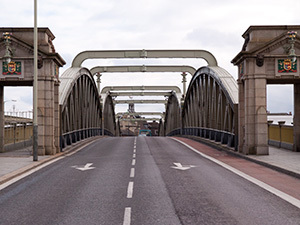 Bridge chapels were once a common feature of major bridges throughout Britain. 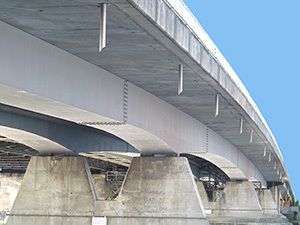 Today, however, apart from the Rochester Bridge Chapel only five other bridge chapels are still standing, at Derby, Rotherham, St. Ives in Cambridgeshire, Morpeth and Wakefield, plus a former lock-up at Bradford-on-Avon which may once have been a chapel, the chapel ruins at Cromford in Derbyshire and some remnants at Elvet Bridge in Durham. Mostly built during the 14th or 15th centuries, these bridge chapels provided a place for travellers and pilgrims to attend mass and pray for a safe journey, just as airport chapels provide for travellers today. Many were also chantry chapels where prayers were said for the souls of the founders and benefactors and some also collected tolls or sought alms to finance the upkeep of their bridges. 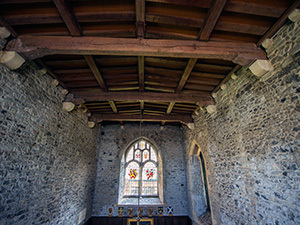 Today the interior of the Rochester Bridge Chapel looks much different from its appearance in medieval times. 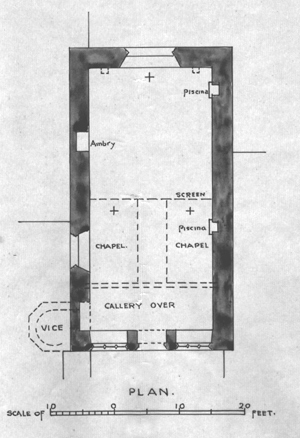 The inner dimensions of the chapel, 40 feet in length and 19 feet in width, remain the same. Originally, however, there were two windows on the south wall, the outline of the second now just visible in the stonework. The high altar stood against the east wall, flanked on either side by lamp corbels, now broken off in line with the wall and hidden behind the modern oak panelling. On the north wall is an aumbrey, or recessed cupboard, which would have been used to store the chalice, wine, candles, and other supplies for Mass. At the eastern end of the south wall there is a piscina, or stone basin where water used at Mass was poured away. Half way along the south wall, also hidden behind the panelling, are notches for the rood screen which would have extended across the chapel, dividing it in half. Against the western side of the rood screen, on either side of its central doorway, stood two additional altars, as shown by the second piscina in the south wall. Although the chapel was named “Allsoulen chapel,” it was founded in honour of the Holy Trinity, the Blessed Virgin Mary, and All Saints, probably reflecting the dedications of the three separate altars. At the west end of the chapel is a gallery, originally reached by a circular stairway in a clock tower at the northwestern corner of the chapel. 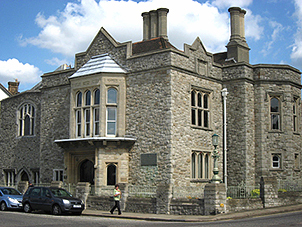 Only the small pointed doorway in the recess on the ground floor and a similar doorway on the northern wall of the gallery remain today to show where the clock tower once stood. A door on the south side of the gallery, opening into the Audit Chamber, allowed access to the chapel for the bridge officers. The three chantry priests, each earning a salary of £6 per year, celebrated intercessory masses for health and well-being of Sir John de Cobham and the other benefactors of the bridge and for the repose of their souls after death, until the chapel was suppressed during the Reformation in 1548. 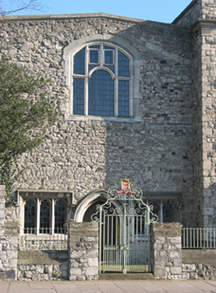 Over the next three centuries the chapel was used first as a storeroom for the bridge workmen and then was converted into a house, serving variously as a private dwelling, a public house, and in Victorian times as a fruit and sweet shop. 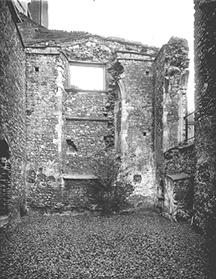 When surrounding buildings were removed in 1879 during the construction of the Bridge Chamber, little more than a ruined shell of the medieval chapel remained. 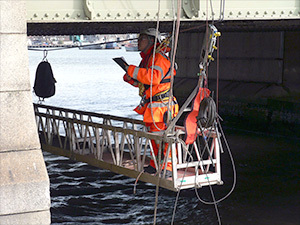 In 1937 the Wardens and Assistants restored the Bridge Chapel. During the restoration work the chapel was re-roofed, the floor was tiled, windows were repaired and reglazed, and the oak panelling was installed. The chapel is now used primarily for meetings, dinners and other functions. 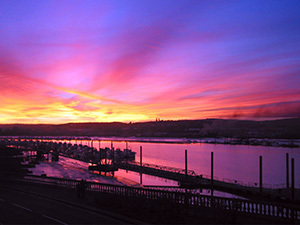 Once a year on 2 November, All Souls Day, a service is held in the chapel to commemorate the founders and benefactors of Rochester Bridge. 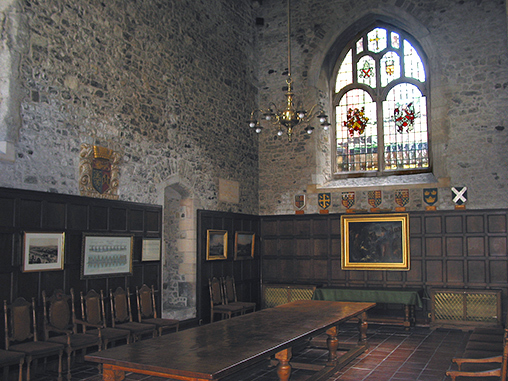 Above the panelling on the north wall is the Coat of Arms of the Trust, on the east wall are the Arms of Thomas of Woodstock, Duke of Gloucester; Edward the Confessor; Edmund, Duke of York, Richard II; John of Gaunt, Duke of Lancaster; St. Edmund; and St. Andrew, and on the south wall is a plaque commemorating the building of a porch at the west end of the chapel in 1735 to store the bridge records. 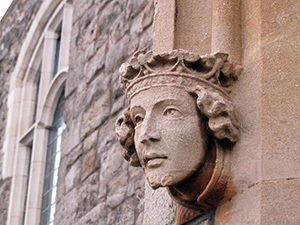 These stone Arms and plaque were all originally displayed on the west front of the chapel until the removal of the porch in 1879. 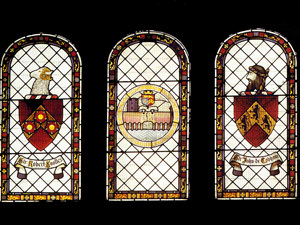 The Arms in the east window are those of the See of Rochester, the City of Rochester, and the two benefactors of the bridge – Sir Robert Knolles and Sir John de Cobham.